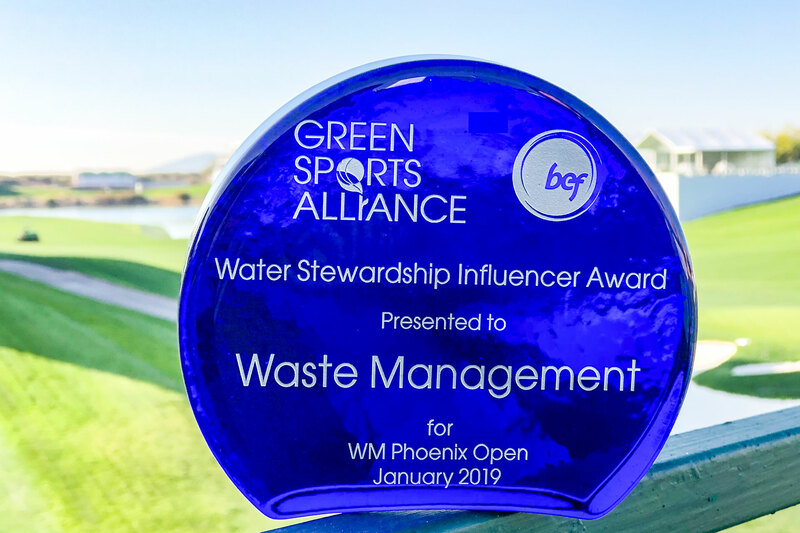 Waste Management was recently honored with the “Water Stewardship Influencer Award” presented by Green Sports Alliance and Bonneville Environmental Foundation (BEF) for the company’s awareness and conservation efforts at the Waste Management Phoenix Open. The award was presented at the ASU Sports and Sustainability Symposium held at Arizona State University on January 17. BEF teamed with the Green Sports Alliance to honor organizations that are not only exhibiting excellence in water conservation and restoration, but also leveraging their position to bring others along with them to directly grow a movement around environmental water stewardship. Waste Management and the tournament hosts, The Thunderbirds, implement water conservation measures to ensure water is used responsibly at the Waste Management Phoenix Open. Measures include handwashing stations utilizing hand sanitizer instead of water and grey water is collected in the kitchens across the course as well as the hospitality bars on the 16th hole to be reused in portable toilets to reduce freshwater usage. Working with BEF and the Change the Course campaign, Waste Management and The Thunderbirds also support the restoration of Northern Arizona rivers and streams. This collaboration, also supported by M Culinary, Kohler, Coca-Cola North America and Swire/Coca-Cola, has restored 236 million gallons to the Verde River and other freshwater ecosystems in Arizona since 2015, including 75 million gallons of water in 2018. These restoration efforts have supported ranchers, farmers and communities across the Verde River Valley. In 2019, Waste Management celebrates its 10th year as title sponsor of the PGA TOUR’s largest-attended event. Over the last decade, Waste Management has turned the Waste Management Phoenix Open into the most sustainable sporting event on the planet. Since 2013, WM has diverted 100 percent of tournament waste, through recycling, composting, donation, reuse or creating energy – that’s over 6.4 million pounds of material going to its next best use.